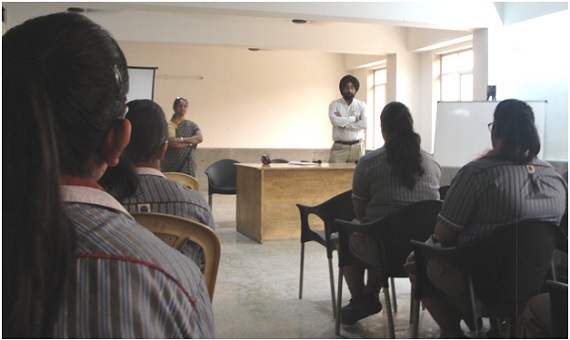 A workshop for the students of class XI was held by Mr.T.C Singh on the career options in Defence. Mr. Singh has done Mechanical and Marine engineering. He has served as Chief Engineer in various Defence ships and took premature relief in 2000 as a commandant. He enlightened the students about the various exams for the graduates and undergraduates to be cleared to enter the Defence. He also discussed about the various academies which help the studentsto enter this sector. A brief on three Defence forces – Navy, Military and Air Force was given with different ranks from the lowest to the highest and their retirement age. The students were also informed about the privileges and benefits awarded to officers. It was an Interactive workshop, the students were asked number of questions like the chief of Army, Defence Minister of the country etc. They also took keen interest in asking about number of queries related to this sector. In the end the students felt contended and motivated with acareer option that they can think of pursuing after their 12th standard exams.